When social media was new and people called it a fad, the businesses who were early to adopt it had one goal and one goal only. And it makes sense considering the fact that almost everyone who followed you saw your posts. And since they didn’t have a lot of content to engage with, and the competition among content was low, yours would see a lot of engagement. As social media grew, and the competition was getting tougher, the engagement dropped, and now, not everyone will see your posts. Then the algorithms started to happen. Today, almost every social media platform uses an algorithm to sort the content that you see in your feed. The algorithms’ goal is to present the content that you will find the most relevant, based on several different factors. 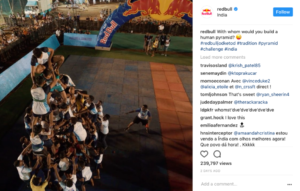 In June 2016, Instagram rolled out their feed algorithm, going from a chronological feed, showing every single post from the users you followed in your feed. Today, the number of people who follow you who see your posts in their feed is at an all time low. 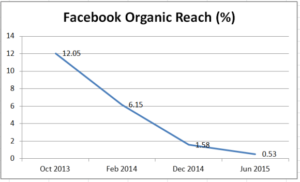 And it’s continuing to decline- across all social platforms. Well, it means that the mindset has switched, going from purely focusing on follower count, to also brining in engagement and relevance into the equation. Sure, the conception that followers is everything still live on, and I come across this daily. But luckily, engagement is now starting to get acknowledged and put in the spotlight, for brands as well as influencers. Social media is not what it once used to be. Does it mean that it is generating worse results? It just means that you need new approaches and strategies to reach your goals. And engagement is a tremendously important part of that. In this article, we’re looking at reasons to why social media engagement is important for your brand, and 5 things you need to do to increase it, make your audience more engaged in your brand, and in the content you share. Okay, so we’ve sorted out the fact that follower count isn’t the only thing that matters anymore one social media. Still, I regularly come across misconceptions about social media engagement and followers. I had hoped that this matter would have been log dead by now, because I know how many brands are missing out on amazing opportunities on social media because of misinformation, and myths that still live on. But you know me. I’ll gladly try to sort out the issue around social media engagement, and do everything I can to help you achieve your social media goals. The most common reason to why brands are focusing on followers and not engagement is because followers are so easy to measure popularity with. The reason you have social media is because you want to sell more. You might say: “well, I want to increase brand awareness” or “I want to increase sales“, but what does these eventually lead to? No business wants to increase brand awareness if it wouldn’t be for the fact that this eventually turns into sales. You can have millions of social media followers, but if these aren’t engaging with your brand, you won’t have the opportunity to impact them and convert them into customers. Your followers will just… sit there. You’ll be far better off to have 10K highly loyal followers than 100K inactive followers that doesn’t interact with your brand or posts. Why do you want a high engagement? This is one of the most common questions I see. I’ve already touched upon it briefly, but let me elaborate my reasoning. I said that having an engaged audience lets you impact them in a better way. And it is true! The thing is that when you have an engaged audience, they’ll be looking forward to your posts, and engage with them on a regular basis. This means that they’ll get constantly reminded of your brand’s existence, and always stay on top of their mind. Social media engagement is not only about having followers who engage with every single post you share. It’s also about you engaging with your audience. As a brand, customer service plays a highly important role. It can be as simple as responding to a question, or answering quickly to a customer complaint. In these cases, response time plays an important role. Succeed in giving them an answer they are satisfied with, while also responding in time, and you’ll have a great chance in making them loyal supporters of your brand. I could be rambling on about how having an engaged audience on social media helped me pledge $2000 in 24 hours, or that regularly engaging with my audience has resulted in almost 50% of my total sales, but instead, I’ll let the statistics speak. When you engage with your audience, you’re getting to know them on a much deeper level. Engage successfully and you’ll build relationships with your audience that’s lead to sales time and time over. Did you know that on average, loyal customers are worth up to 10 times as much as their first purchase? That’s quite a significant number! And let me tell you, this number isn’t achieved by having lots of unengaged followers on social media. It can be achieved by just having 100 highly loyal followers! Did you also know that by far, the most requested improvement from customers was “Better Human Service”? Social media is one of the most effective tools to proving customer service with personality. So how can you increase your social media engagement, make your followers loyal, and build valuable relationships? Guess what the answer is most of the time! It’s not difficult to understand why responding to comments is so incredibly important, yet still, I see brands all the time who aren’t doing it! Social media is just like a conversation in real life. It’s no different! But strangely, many people tend to believe it is. When someone talks to you, they want you to respond back. If someone asks you a question and you turn your head the other way, what do you think will happen? Chances are they’ll say screw you and go somewhere else. When someone asks a question, or just writes something, make sure you respond to it. If the same person is commenting over and over on your posts, but you aren’t responding, chances are they’ll do the same as they would in real life. Say F you and go to your competitor or someone who actually responds to them instead. If someone asks a question: answer it! If someone compliments you for a beautiful photo: thank them! If someone complains about a bad experience with your brand: show that you are doing everything you can to solve it! 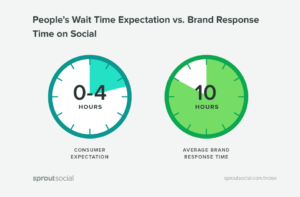 Customers are expecting a response within 2 hours, but in average, brands respond within 10 hours! If you can provide people with quick responses, they’ll see your brand in a positive light, and go from the conversation thinking “what an awesome brand”. Not only are you making the people you interact with happy, you’re also dramatically increasing the chances of them commenting on your future posts. If they know that they’ll get a response back from you when commenting, they’ll comment on your post for the sake of engaging with you, and this is where the true relationship building takes place. When you can interact with them on a deeper level than just saying “thank you”. Humans like to be heard. When you ask a question that makes it seem like you are asking every single follower of yours a question personally, they’ll feel obligated to answer it. This works in the opposite direction when a follower of yours is asking you a question. It’s about giving and taking. When they ask a question, they expect to get a response. When you ask a question, you expect to get a response. 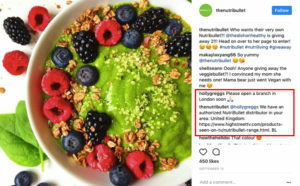 NutrBullet knows this and therefore responds to their customer’s questions. When you ask questions in your social media posts, you show your audience that you value their opinions and that you care about what they have to say. It also gives your audience the opportunity to share their opinions, tips, thoughts, wisdom, and knowledge. The beauty about asking questions on social media is that you can get answers that are valuable for you, while also achieving all of the things above. For example get their opinions on future products and marketing decision. What’s more, questions can also be a part of a market research for your brand. It might not be very surprising, but the Instagram post that I’ve gotten the most comment on is one that contains a question. More exactly, the question was “Where are you from?”. The post was able to boast a whopping 195 comments! 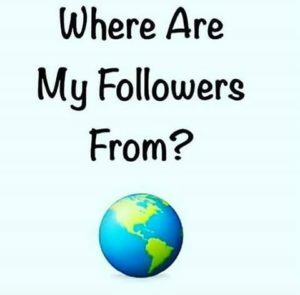 Asking a question like this is an easy way to spark conversation and then when the followers have left their comments, hop in and engage with them, and ask more questions about the place they are from. This shows that it’s not only about asking questions in your posts that matters. A bonus tip is that you should create a beautiful visual containing the question. Not all people are reading the captions of a post. They just scroll and scroll until their eye meets something appealing. If your posts doesn’t do that, chances are they’ll miss your question. If you, on the other hand, ask a question in the image, they can’t miss it, and you’ll see more comments! If I would have posted a regular image, then asked the question in the caption, I can assure you that the number of comments would be far less than 195. There are an endless amount of questions you can ask. You just need to make sure that you ask questions that are relevant to your audience. If you’re a company that sells running shoes, why not ask questions about running? The more niche-specific your questions are, the more niche-specific answers you’ll get, and the more targeted will the people who comment on your post be. Chances are that not all of your followers will be running-maniacs, and therefore, it can be good to mix more general questions such as “where are you from” and “Where do you usually go running” to get everyone engaged and involved. In general, broad questions always work. As I touched upon, not every single follower of yours will be completely addicted to your niche. Some will be just “Kinda interested”. Therefore, to get everyone a part of the conversation, you need to have different types of questions in your ammunition. The generic questions are the ones that are most broad. These can be asked to anyone no matter who they are interested in. These types of questions generally generate the highest number of comments, simply because there’s nothing that limits who can answer them. “Where are you from” is one example of a generic question you can ask. Niche-relevant questions are the type of questions that are related to your niche as a brand, for example running shoes. Here, anyone who has even the smallest interest in this niche can answer. While most of your followers should be able to answer (if you’ve built a targeted following), you’ll generally see fewer comments on these types of questions. Niche-relevant questions can be anything from “Do you jog?” to “Do you wish you would go out and run more?”. As you can see, they’re more related to the niche the brand is in, but they’re still fairly broad, allowing most people to join the conversation. These are the most specific questions related to your niche. Here, only the most interested and passionate people about your niche will respond. While you will receive fewer comments, the comments you receive will be highly relevant and very valuable. Since questions like these identify your followers whoa re the most passionate, it allows you who engage with the people who are most likely to become customers of your brand. Bonus question: Community based questions. Last but not least, we have the community based questions. These questions are incredibly valuable to ask every now and then, because it allows you to build a community and fellowship around your brand. For brands, communities that purely circulates around the industry and the brand is highly valuable, because these allows your customers to feel like they are part of something greater than just a product. Think of anything that includes a large group of people. They’re all circulating around one thing. And they build a relationship among the people who are within it, allowing them to share their experiences and passions. Take the forum RolexForums, for example. It’s a whole forum dedicated to people who have a passion for Rolex watches. While community based questions don’t lead to a full-on community like Rolex Forums, they’re definitely a start to building a community around your brand. Not all social platforms allows you to run polls, but those that do, should be used for it. Have you created polls before? The most common social platforms where polls are created is Facebook and Twitter. The best part is that polls are super easy to create! 1. Click on the compose button at the top-right corner of you Home Timeline. 2. Click on the “Add poll” icon. 3. Type your poll question. You can create a question containing up to 140 characters. 4. Insert your first poll option in the “Choice 2” box, your second poll option in the “Choice 2” box until you have as many choices as you need. You can use up to 25 characters for each option. 5. Click + if you’d like to add additional options to your poll. Your poll can have up to four options. 6. Your poll’s duration can last from 5 minutes to a maximum of 7 days. Choose your polls duration by clicking 1 day, then losing days, hours, and minutes. 7. Click tweet to share the poll. Twitter polls is a fun and engaging way to get your audience’s opinions because all they have to do is click on a poll to express their opinions. Not write a whole bible. This makes polls more appealing, often leading to more people engaging with your post compared to if you’d ask a question that demands them to actively take part in it. 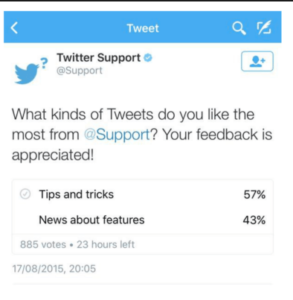 Twitter support uses polls to better understand what type of content their audience likes, so that they can provide more of it in the future.In that way, polls can work as a market research tool, while also having the benefit that it shows that you care about your audience’s opinions. Taco Bell uses polls to get their audience engaged by hearing their opinions. 1. Set up your Facebook poll by going writing this link (https://apps.facebook.com/my-polls/) in your browser’s URL bar. If you aren’t logged in, you will be prompted to do so. 7. Type in your question. 8. Choose the type of the question. 9. Fill in answers to your poll. We’ve seen the statistic that showed that customers want better human service. But did you know that employees only ask for the customer’s name 21% of the time. Did you also know that your customer has a name 100% of the time? Your customer has a name and they like hearing it. Writing to your customer by name is the first step to creating a more personalized service and building a relationship with your audience, but there’s more to it than that. The reality is that really, nobody wants to engage with a fancy logo and brand name. Humans are developed to speak to humans, and if you can show that you’re a person with feelings, opinions, thoughts, and anger, just like anyone else, people will have a much easier time to engage and interact with you. The second step is to use your own name when writing to your customers. When you give the person you chat with your name, they’ll be able to resonate with you in a better way, and the conversation will feel much more personal than saying “I was talking with someone from Coca-Cola”. 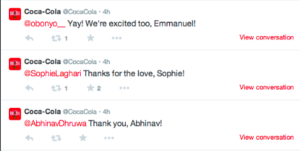 Compare that with saying “I was talking with Ben from Coca-Cola”. What’s even better is if you address the inquiry with both their name and yours. 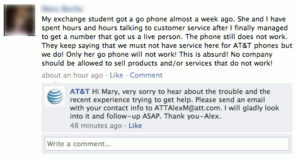 Like AT&T. That way, it becomes a conversation between you and your customer. Addressing by names is extremely important, but to make it even more personal, you need to go much deeper than that. When you know your audience, you can use a language that resonates with them, and makes them see you as one of them. To do so, you need to know how you want to present your brand, and what your target audience is. 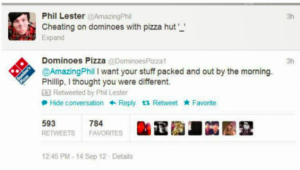 Dominoes Pizza knows who they are targeting very well, and therefore, this message works very well. If Bank of America would have written the same message, the reactions wouldn’t have been as great. If you are targeting teens, then speak to them in that language, and present your brand in a way that they resonate with. However, be careful with using slang that comes of as you trying too hard, because it can backlash. 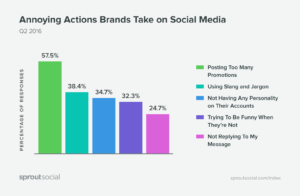 In fact, 38,4% of customers thinks it’s annoying when brands use slang or jargon that comes off as inauthentic on social media. Last but not least, when looking to be personal on social media, it’s also about how you present yourself in a one-on-one conversation. If you don’t show any emotions, thoughts, or ideas, you’ll, in worst case scenario, come off as just a chatbot or automated message. Therefore, peak in your own thoughts and opinions where possible, and have a conversation just like you would with a friend. When you do, people will have an easier time resonating with you, and build trust in you. Thus, your relationship with your customers becomes stronger. Today, if you want to generate great results with your social media efforts, you need to focus on acquiring the right type of followers, and build relationships with them. Having engaged followers is vital to converting them to customers and long-time supporters of your brand, and luckily, there’s a lot you can do to make that happen. By building strong relationships with your audience, you increase their trust in you, and are able to impact them on a more personal level, rather than as a brand. Back in the days, growing followers on social media was the main goal of brands, but as social media has evolved, having relevant followers is what really matters, today. Are you working actively to build strong relationships with your audience?